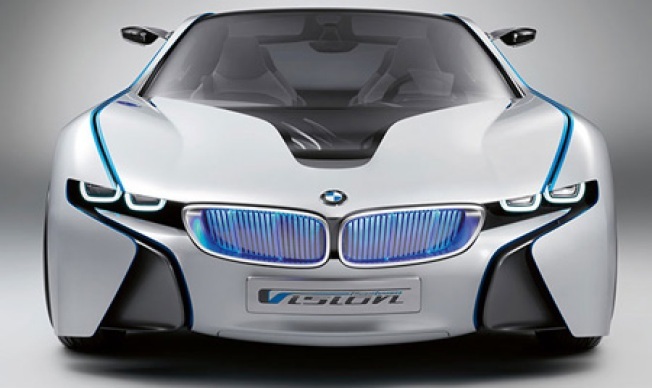 BMW has unveiled a plug-in diesel hybrid supercar concept that, if it performs as promised, could achieve speeds of 155 mph and a 0-60 time of 4.8 seconds. The new BMW Vision Efficientdyanmics Concept comes with a unique 356 horsepower drivetrain, all wheel drive, and the ability to travel up to 31 miles without kicking in the diesel engine, according to Autopia. The car is a 2+2 four-door (!) that BMW claims will get 62 miles per gallon and emit just 99 grams of CO2 per kilometer, which is similar to a Toyota Prius and especially impressive for a diesel engine. The report said that the lithium-polymer battery pack consists of 98 cells, doesn't need active cooling, and recharges in two and a half hours using 220 volts. It's doubtful the car will see production at least in this guise. For now, consider it a rolling technology bed for future high-performance BMWs. Another photo after the break.